We became interest in fractals as part of our experiments in chaos theory. Music can also be related to chaos theory. Combining music with fractal animation to create music videos just seemed like a classic thing to do. Remember, chaos is not a messy situation. Chaos is not anarchy. Chaos is the study of unordered systems. A collection of our classic fractal animation videos can be viewed here. A fractal is generally "a rough or fragmented geometric shape that can be split into parts, each of which is (at least approximately) a reduced-size copy of the whole,"a property called self-similarity. 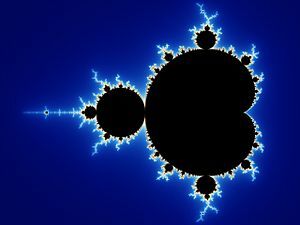 The term was coined by Benoit Mandelbrot in 1975 and was derived from the Latin fractus meaning "broken" or "fractured."